We are finally here, the Disneyland Half Marathon! 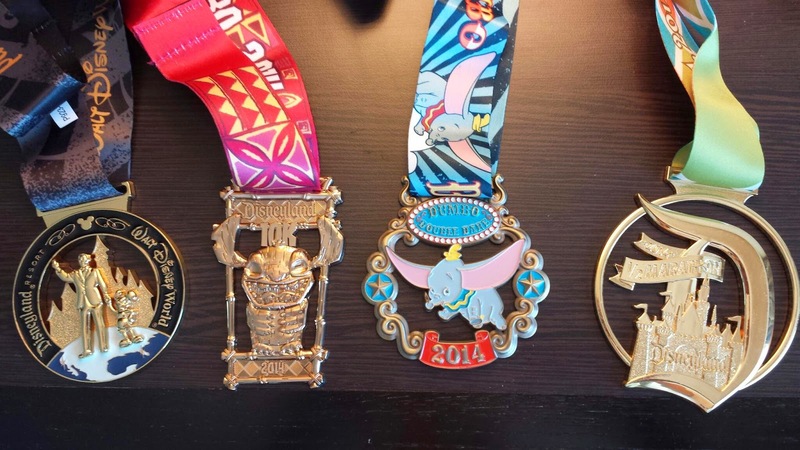 This race will always have a special place in my heart; it was the first runDisney event I ran five years ago, and we've run this race every year since. We've seen some changes and a lot of growth over the years, but nevertheless, no diminishing of magic! We woke up bright and early a little after 3:00 am. This was the third early morning, and surprisingly enough, it wasn't too bad since we made a point to be in bed very early the night before. We got our costumes on and ate our typical breakfast: PB&J sandwich and some water. I also drink an energy drink (I'm not a huge fan of coffee) and bring a banana to the starting line. Soon enough, we were headed to the ART bus to the starting line. We met up with our family at the bus again and headed to the start. It's almost comical how systematic we are on this race morning. We know exactly which bathrooms to use, what the order of tasks are, and exactly where to go. It's somewhat comforting to have that knowledge and really put my mind at ease on this difficult morning. Chris and Katie left early for their corrals, and Bill walked with me. I had to stop again for the bathroom (it was really just nerves). I was starting in corral B, so I said goodbye and headed off on my own. Blogger disclaimer: Sorry for the lack of pictures. I was really worried about finishing this race, so I didn't stop. I had only one focus--cross the finish line! It was almost time to start, and the announcers told us A & B would be let off together. Seriously??? C'mon runDisney! Just give me an A corral placement already!!! I lined up at the very end, knowing I'd be the slowest in the crowd. 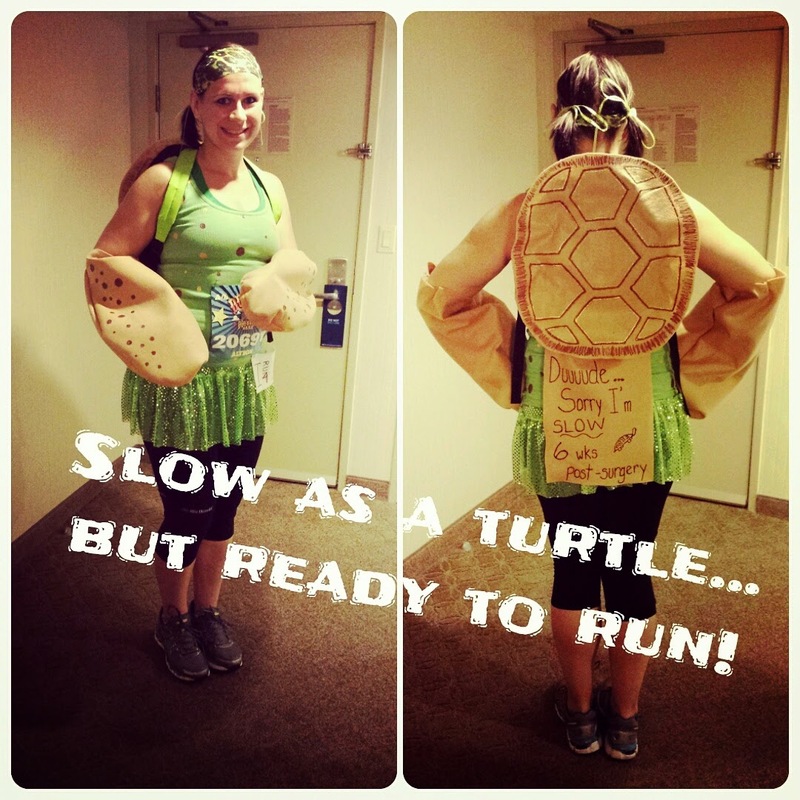 I did try to be a considerate runner--I started last, stayed to the right (even taking wide turns when needed), and had a warning sign on my back. I had my run/walk/run timer set to 30 second run/1 minute walk. I tried trotting a little yesterday, which didn't feel terrible, so why not? I started to trot. I was going SO slow, the crowd thinned out quickly at the first mile. Soon it was just me and a few others running down Katella. I couldn't help but wonder what they were doing back there. Were they injured too? Did they not train enough? I was so focused on one foot in front of another, no time to really figure it out. Just before mile 2 where you enter the back road to California Adventure, the speedy corral C folks started passing me. Once we were up to mile 2, I was in the thick of corral C. I got a few "way to go"s and a couple "you got this" cheers. Once we were into California Adventure, I was at the back of the corral C runners and some corral Ds were there too. That was the last time I was really alone in the race. The sites and sounds of DCA and Disneyland definitely kept me preoccupied for the next few miles. You spend 2-4.5 in the parks. All those special moments are there and was comfortable keeping my 30 sec/1 min pace. Then you hit the streets of Anaheim. I've said it before and I'll say it again, the community support at this race is awesome! Personally, I don't mind the endless miles of streets because there always seems to be something fun to look at. This is where, I have to say, the running community put my on their backs and carried me to the finish. I am not exagerating when I say I think I had at least 500 people stop, say "Hi", tell me to keep going, tell me I was an inspiration (really...me? I take that very seriously and I get teary-eyed even writing that here). I kept going. It was seriously a miracle. It was like for these few hours my pain was secondary to my happiness. Before long, I could see the Honda Center and Anaheim Stadium. Is it just me or was that stadium louder and more packed this year than ever before? It was the perfect pick-me-up and it meant that I was almost to the finish. I keep up my pace, and even noticed I might get into the 2 hour range. After the stadium, it was almost a blur to the finish, but I paced it perfectly and finish in 3 hours and 47 seconds. Just 48 seconds out from a 2 hour-something finish. Poetic to say the least--I needed to let the time go! Who cares how long it takes? It's about finishing what you start! In Disney races, you might say I'm usually a "front of the pack" runner--no, not super speedy in any way, but I'm usually in the first few corrals and finish in the top 25% percentage. This year, though, I spent my hours with the middle of the pack, even into the back of the pack. It was AWESOME! I definitely no longer fear being in the last corral or having my time messed up. The people I ran alongside pushed me past what I thought was even possible. It was fun, and everyone was positive and encouraging. Truly a magic race experience. So there you have it! 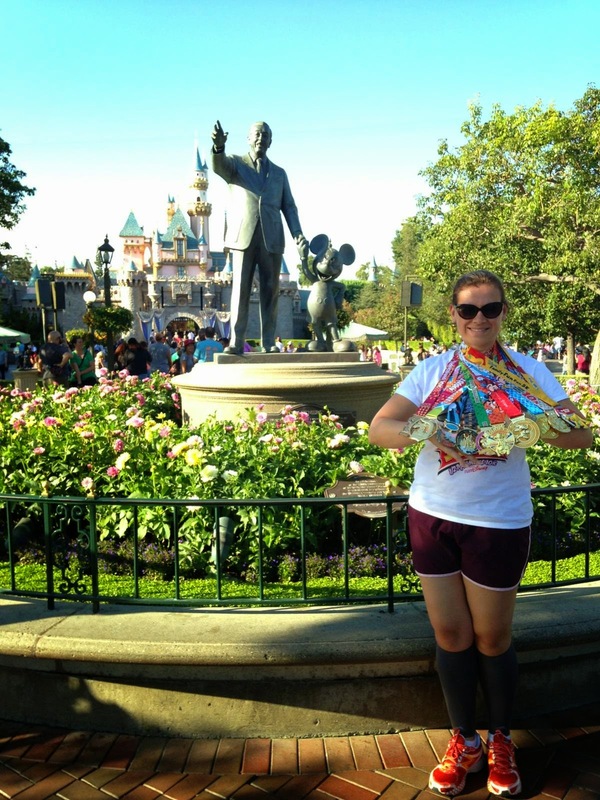 The 2014 Disneyland Half Marathon Weekend! It was our 5th time running this event, and no doubt it will NOT be our last. Were you there? How was your race? My C2C Bling! Dopey + Dumbo! Great recap, and congratulations! The excitement at Angel's Stadium is an AWESOME pick-me-up! :) It was my second DDD and C2C. I struggled a little bit towards the end -- and I just can NOT run in the heat! -- but it was a lot of fun. The heat this year wasn't as bad, but it WAS still hot! The other years were beautiful...not sure why we have gotten so unlucky lately :-) Congratulations on your races! 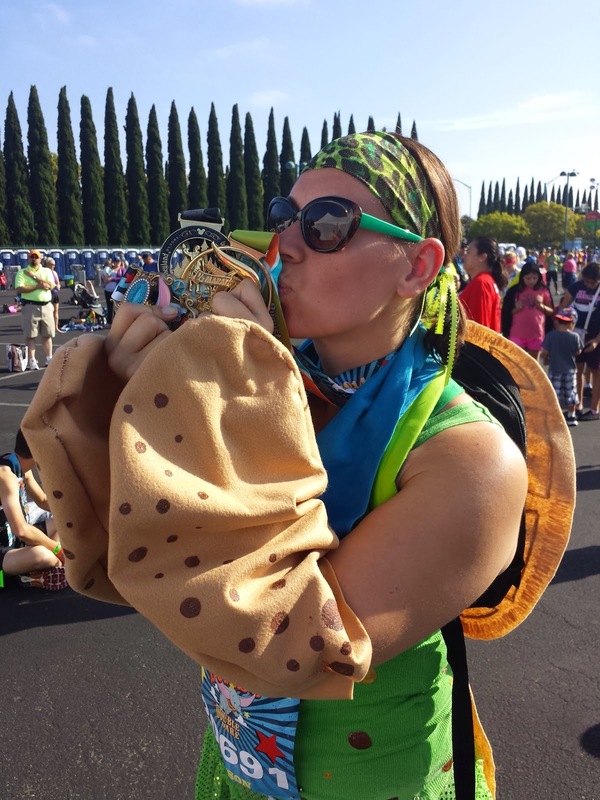 I love your costume, and wow, look at all that runDisney bling! I'm so impressed you got out there and ran your races after surgery, you are truly an inspiration!! !